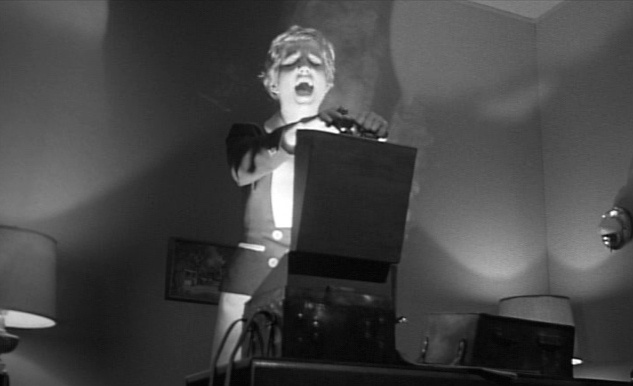 I slapped my way through Day 5 of the Film Noir fortnight with Kiss Me Deady (1955) - a Mike Hammer adaptation stuffed full of heartless beatings, torture, throwing people from cliffs, crushing them in cars and a suitcase full of nuclear annihilation. Thrilling, innovative, savage, featuring the original glowing suitcase macguffin as ripped in Pulp Fiction. Film Noir with Nouvelle Vague flourishes and the blackest of souls. No Stacy Keach here. Directed by Robert Aldrich, the screenplay was strangled from a Mickey Spillane book that writer Al Bezzerides is reported to have hated. Crimer writer, Bezzerides went on to write for other noirs including 'They Drive by Night' (1940), 'Thieves' Highway' (1949), and 'On Dangerous Ground' (1952). Aldrich regretted taking on the project, due to the failures of two previous Spillane adaptations. The writer and directors' enmity may have helped nurture the nihilistic, unforgiving tone that permeates the film. They moved the book from New York to Los Angeles, introduced the stomic subplot and forged one of the greatest noirs out there.